Hailing from a groundbreaking term at Vetements, Demna Gvasalia has pushed the direction of Balenciaga even further into the sphere of the discerning sartorialist. These blue cotton regular-fit jeans feature a front button fastening, belt loops, whiskering at the thigh and a five pocket design. 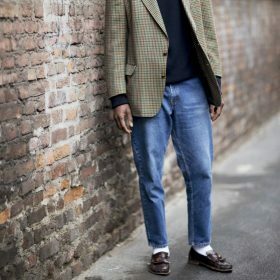 Sometimes you just can’t knock the classics and men’s straight leg jeans are exactly that! Is it time to refresh your collection of classics? Fashiola, the fashion finder, is the best place to start. Now if you really wanted you could find a modern version of men’s straight leg jeans in quirky colors and distressed detailing however sometimes it’s nice to own a pair of jeans which you know you can wear in almost every situation. If that’s the case for you, click to filter for blue straight leg jeans and start your search for a new pair of classic and comfortable jeans.